Time-based rules so you can stand behind your commitments to your customers. If you guarantee that you will always reply within a certain time frame, Front can give you a warning as that time approaches. Go into your Settings, select Rules, and Add a team rule. Unreplied after - will trigger if there is no reply to a message after a given delay. 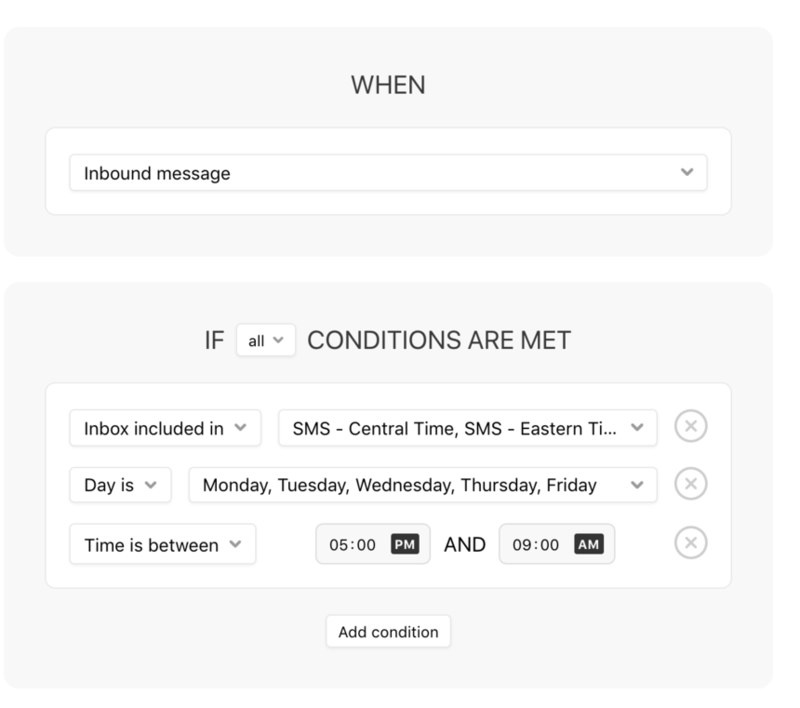 This condition will trigger for both inbound and outbound messages depending on the condition selected. 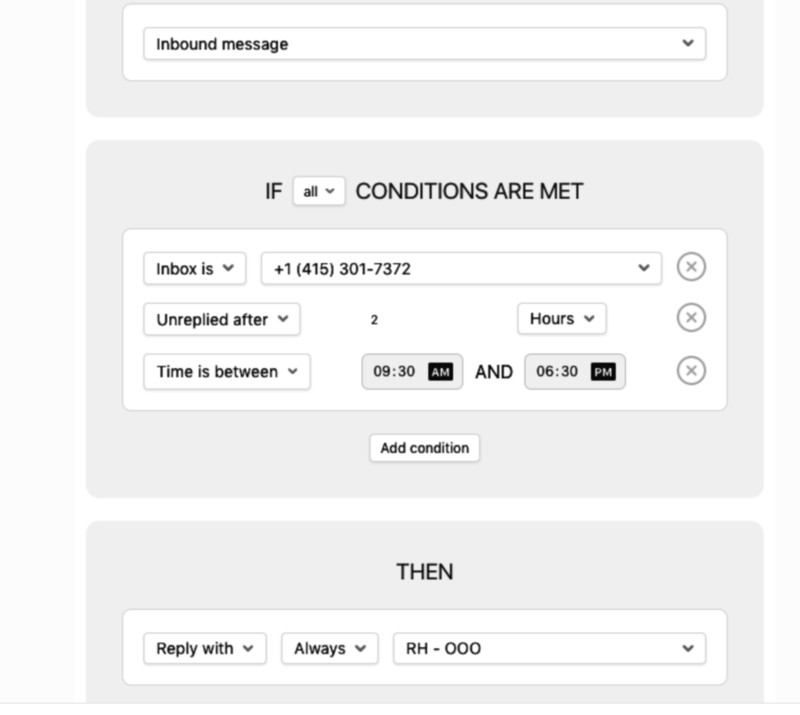 Unassigned after - will trigger if you receive a message and the conversation is still unassigned after a given delay. When a time-based rule is triggered, i.e. 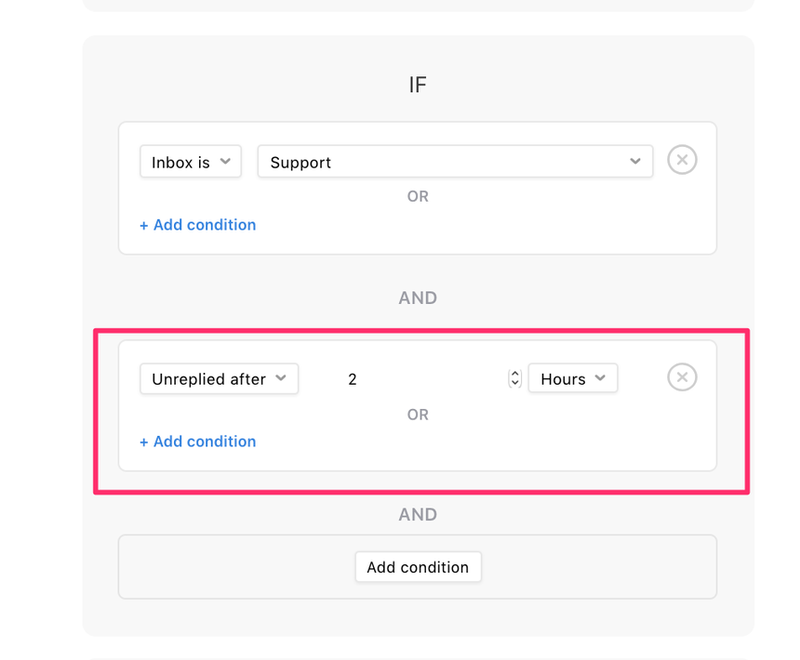 a WHEN condition is matched, the rule is immediately scheduled. When the timer completes, the rule will evaluate the rest of the rule conditions according to the current conversation and determine whether to execute the actions of that rule. Click Save to save your rule. 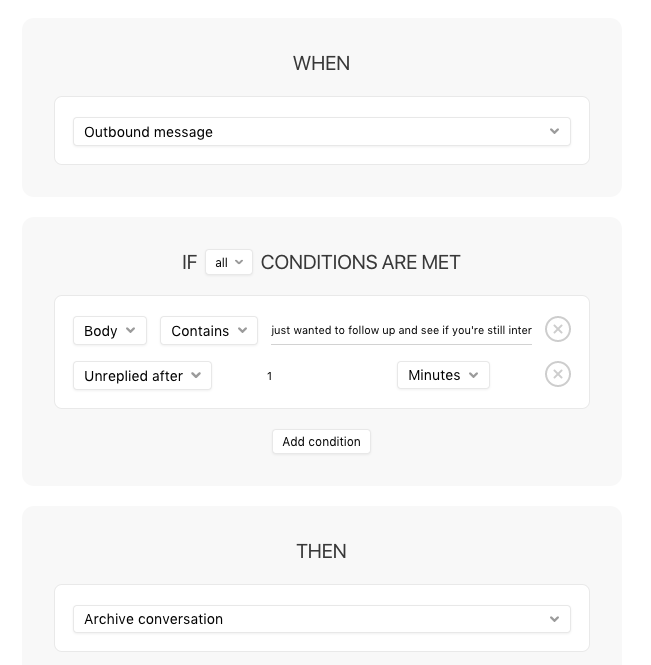 Move conversations to an escalation inbox - By creating an additional inbox with no connected channels, you can create clear escalation paths and educate your team to prioritize conversations as they become more urgent. Notify the team and manager - With the notify rule action, you can select key members of a team who should always be kept in the loop as SLAs approach. Tag the conversation for long-term tracking - You should track conversations at your SLA markers to better identify trends and team performance. Note: Actions from an asynchronous, or time-based rule will not be used to trigger other rules. can i explicitly set timezone for my rules ? Can we apply rule with old Email that already be in the Inbox? or the rule will only active with new incoming Email? Thongtod Linthong (Leo) Rules don't work retroactively at this time. I use front for sms & mms messages. Can I use a rule that an unreplied message can be replied to automatically at a certain time? Cori Morris Yay! It worked. Thanks! I'm trying to create a kind of specific rule. Our automated texts and emails are sent out to customers a few times a week. Generally the customer don't reply to them but the outbound tickets are left open in our box. Is there a way to set a rule for the ticket to be resolved if there is no customer response? I originally thought it was to set it to outbound message, body contains "XYZ", unreplied after "x". This page seems to indicate that the rule would close out the ticket if we don't respond and would do it again if the customer responds and we don't respond in time. Or does the body portion of the rule only apply to the newest message in the thread? Andrew Bristow Can you share what you're current rule looks like? Andrew Bristow How are you sending these automated messages? Via our API? Could you send over a Conversation ID for one of these conversations? Andrew Bristow Ok, then you'll need to change the trigger to inbound instead of outbound. Andrew Bristow Can you tell me the name of this rule? 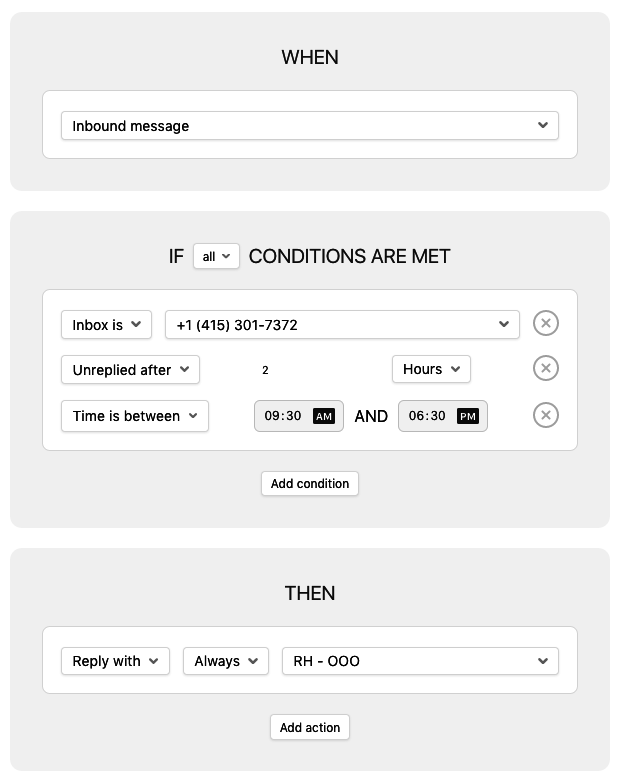 I use Front App for SMS primarily and in conjunction with Agile/Zapier, etc. I want to create a rule that automated texts don't send between certain hours (I'm noticing texts going out at like 6am, etc)... is this possible with this Rule? There's no way for Front to tell Agile when not to send these automated texts. Maybe there's a way to set this up differently in Agile? Cori Morris If I make an after hours rule from 5pm-9am. will it be an error because of the 24 hour period or will that work for auto replies during after hours? Ben Leon Hi there! As long as you aren't using a "Day is" condition as well, then it should work as expected from 5pm-9am. Cori Morris so this wouldn't work? Would I have to make a rule for each day? Ben Leon That will trigger Saturday until 9am. When the end time is "less than" the start time, we add a day. Hello Cori, In your example above that I copied here, if the inbound message comes in at 4:45pm will the timer stop at 6:30pm an resume at 9:30am?